Brett Kavanaugh, President Donald Trump's U.S. Supreme Court nominee, embraced judicial independence on Wednesday but sidestepped Senate Democrats' questions on whether a president can pardon himself or fire a prosecutor investigating him. On the second day of a Senate confirmation hearing disrupted repeatedly by shouting, anti-Kavanaugh protesters, senators pressed the conservative federal appeals court judge on his views about presidential power, abortion and gun rights. All three issues deeply divide Americans and could come before the Supreme Court, with Kavanaugh seen by both conservatives and liberals as someone likely to tip the court in an even more conservative direction. Kavanaugh signaled respect for the landmark 1973 Roe v. Wade Supreme Court ruling legalizing abortion nationwide, calling it an important legal precedent that had been reaffirmed by the justices over the decades. He condemned the spate of U.S. school shootings but defended an opinion he wrote questioning whether semi-automatic rifles could be banned. Senate Democrats have vowed a fierce fight to block Kavanaugh's nomination. But with Trump's fellow Republicans holding a slim Senate majority, and no sign of defections in the Republican ranks, it remains likely Kavanaugh will be confirmed to the lifetime job on the top U.S. judicial body. Answering a question from Democratic Senator Richard Blumenthal, Kavanaugh said he could not commit to recusing himself from any cases involving investigations or civil lawsuits relating to the president. 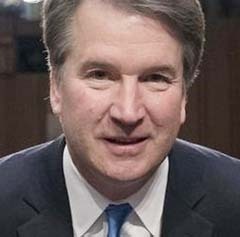 "To be consistent with the principle of the independence of the judiciary, I should not and may not make a commitment about how I would handle a particular case," Kavanaugh said. Asked by Judiciary Committee Chairman Chuck Grassley, a Republican, whether he would have any trouble ruling against Trump or the executive branch, Kavanaugh replied: "No one is above the law in our constitutional system." "I think the first quality of a good judge in our constitutional system is independence," Kavanaugh added.